If you like coming up with songs, but don’t know the first thing about composing or playing an instrument, most of your ideas are likely going to be lost because you don’t have a way to record anything. If you can get your hands on some sort of keyboard, that’s a good first step as it has everything laid out for you. However, getting through the process of recording sometimes takes away from your original idea as you forget and muddle things as you go. Not knowing which key is which makes this even harder as you wouldn’t even know what to write down! The Imitone is hoping to change that, by letting you record with whatever is easiest for you to use. This program is ‘plug and play’, and can turn humming, playing an instrument, or tapping on a table into notes. It’s about as close to mind-to-MIDI as we’re going to get. This will work with all sorts of different music programs, including GarageBand. You don’t even need a fancy microphone, as it can pull from your laptop (if it has a built-in mic). The interface looks almost like a video game, which will help in making it easy to navigate. This will give you volume control, scale selection, pitch bend/glide, and it can detect vibrato. 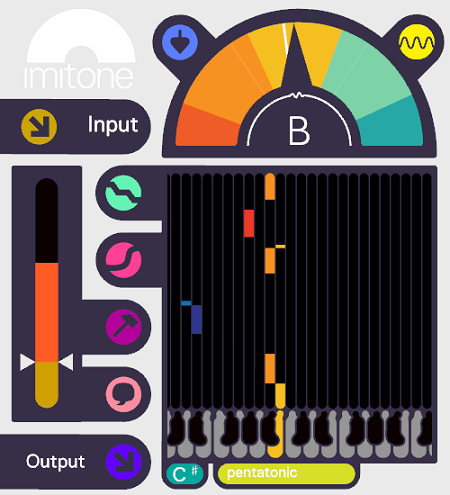 There is a more professional version as well, called Imitone Prime, which will give you voice timbre control, multi-channel control, adjustable tuning, noise cancellation, and more. Regular Imitone will cost you around $25, and the Prime version will cost around $60.